I have to be honest with you: my summer veggie garden was a massive flop! I had pumpkins, since my kids love Halloween as much as I do and I thought it'd be fun to grow our own, cauliflower that was still growing from the previous winter garden, leeks and an assortment of herbs. My herbs flourished! My leeks suffered in the enormous heat we have here in Texas (they're better suited for a fall or winter garden) and my pumpkins? Well, I learned around early October that you need to hand fertilize the flowers yourself to actually get pumpkins. They don't just grow on the vines by themselves. My cauliflower? Never actually sprouted cauliflower! All I got were tall, woody stems that bloomed... But never produced fruit. You know what else flopped? Me starting this early spring raised vegetable garden from seeds. We had the longest, rainiest, darkest winter I've experienced to date in Texas, and it drowned out two batches of seeds I started. So I changed my pace and planted my raised vegetable garden from plants from the nursery instead! When you want an early yield, getting seedlings from a nursery is the way to go, especially with unpredictable spring weather. Here's what I ultimately planted in my early spring raised vegetable garden plot. - Corn: I was surprised to see corn listed as a hearty plant that's good to be planted as soon as the last frost is over. Our last day of frost in Dallas is listed as March 15, which seems super late to me. I can't remember a frost in March as long as I've lived here... But I digress. Corn is a hardier plant and I thought it'd be fun for the boys to see it get super tall. Corn on the cob is also a vegetable they'll both eat (couldn't be all the butter I put on it for them, right?!) so win-win. - Carrots: Since carrots are under ground, they're perfect almost year round where I live. In fact, my carrots last year survived the whole winter, and we had a solid month of below freezing temps! If you saw this recipe, which you should totally make, I used the carrots from my veggie garden for them. Anytime you can turn a vegetable into a dessert, my kids love it. In fact, with planting these, Henry asked if I was going to make a cake! - Beets: Much like the carrots, beets are below ground and perfect for cooler weather. I've just gotten into eating beets! For years, they were the only veggie I didn't really care for. They do taste a tad like dirt to me still, but the color is so pretty and the nutritional value so great that I can get over it. Do I expect my children to eat them? No, but they will enjoy the vibrant colors when we harvest them. Maybe because of that color, they'll try a bite. Here's to hoping! We started the seeds in an old egg carton container in late February. While we have a mid-March frost line, I thought it'd be easy to pull them inside if we got a bout of cold weather, and I wanted them in the ground as close to March 15 as possible so that we could harvest the vegetables before the real heat of summer sets in in June-July. Well, those were good thoughts but a massive FAIL! I planted the seeds and we proceeded to have about 20 straight days of rain and no sunshine. All the seedlings sprouted but only the corn was hardy enough to tolerate all that rain. The beets and carrots got drowned out. I *could* have replanted some seeds, but decided to get plants at the nursery instead, because I didn't get these things in the ground until after March 15 due to all the poor weather we had. Live, learn, adapt and change the plan as necessary, right?! Good words to live by for life, and gardening too. Changing directions, I decided to head to my local nursery and pick up some plants to simply put directly in my garden bed, no more messing around with seeds. I picked up two varieties of tomatoes: heirloom and cherry tomatoes. I got some cucumbers too, because I know they're low profile - they grow on vine-like plants that won't block the sun to the rest of my garden, so they'd be a good option to plant in the most forward part of the garden that gets light first. I learned this last year: Don't plant your tallest plants in the part of the garden that gets sunlight first, or the rest of your plants won't get any! Seems obvious, but I made that mistake just by not considering what direction my light came from. Since I wanted to avoid this again, I planted the corn in the periphery of the yard and planted arugula directly into the dirt of the garden bed. It grows super fast here, so no need to sprout the seeds. I threw those seeds directly into the garden in two neat rows. A note about cucumbers, I've read they attract a ton of garden pests, both animals and insects. We have an 8ft privacy fence that goes to the ground, so the only furry animals in the yard are squirrels and my dog. As far as insects, I'm planning a post in a few weeks on what works (and doesn't) for insect control on a veggie garden! If it can work to keep bugs away from cuc's, then it will work in just about any garden situation. Spring is hard anywhere because of wild weather changes, but especially here in Texas. Both February and March can be 30 degrees one day and 82 the next. I thought I had waited long enough to sprout my seeds but our crazy wet winter had other plans, and rained out all my seeds. No matter though, because I learned that getting plants from the nursery is super easy and those plants can go directly into your raised garden beds. Now that it's nearly April, I'm no longer concerned about any frost, but I do hope that the sun comes out more often to help my budding tomatoes turn into fruit and not drown out my arugula seeds before I even get a salad from my early spring raised vegetable garden! I've always wanted to have my own garden but I don't know much about plants. Love hearing your trail and errors! Your garden is looking great! I love growing my own veggies too. Great post! I love that you can plant corn already in TX! Not up here quite yet, but I do have some herbs coming back up. I love raised bed gardens and growing as much as we can. Your garden looks amazing! I grew up with a decent sized garden in my backyard. Some years it did well & others, not so much! Definitely depends on the climate! I hope I can grow my own veggies someday! 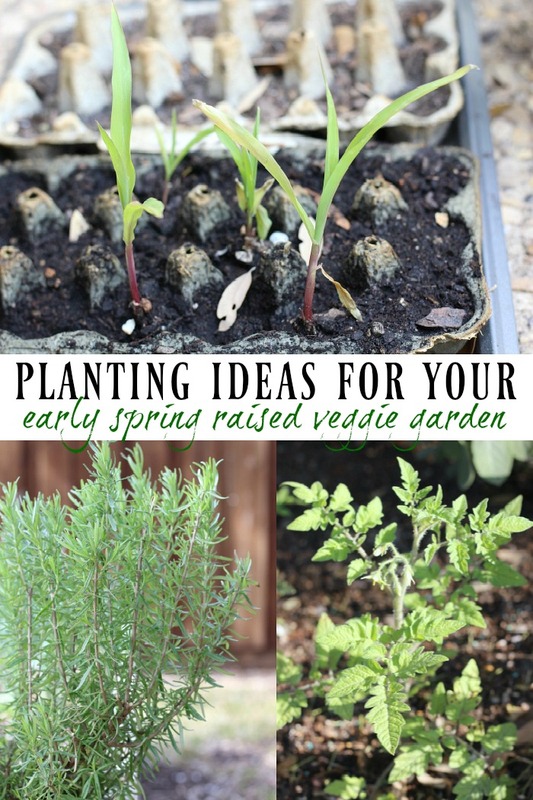 We are going to try our first garden this year and I am going to use this post as my bible, lol! Wish me luck! I love gardening and yours looks gorgeous! Thanks for sharing these great pictures!